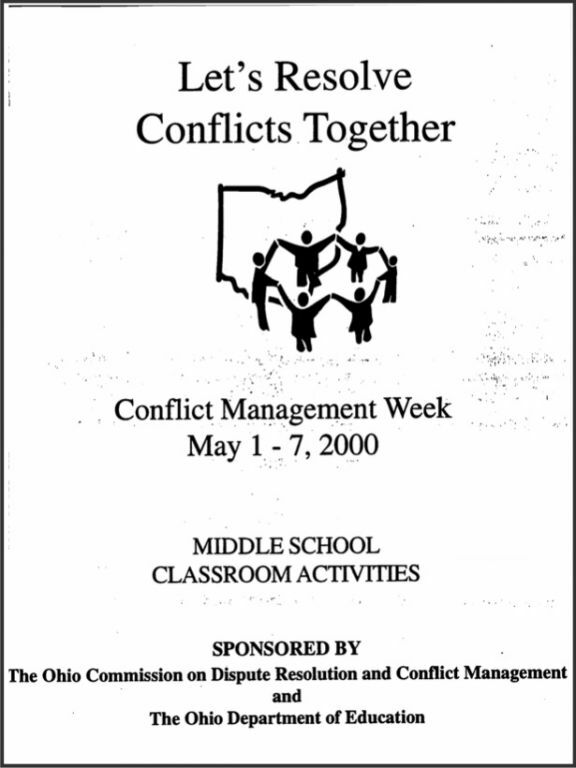 A 30-page guide filled with suggested activities designed to be used during Conflict Management Week (May 1-7, 2000) in Ohio Middle Schools. In the middle school classroom, making use of themes of conflict can invigorate subject areas across the curriculum. This activity booklet/guide offers ideas for improving the overall climate of the school and for learning how to resolve conflicts in the classroom. The guide first presents ideas for drawing attention to issues of conflict and peace. It then provides activities for helping students become aware of underlying causes of conflict. The guide cites the six steps to conflict resolution and states that, in addition to learning steps of a conflict management process, teachers may also work with students to enhance communication skills used in conflict management. According to the guide, these skills include understanding blocks to communication, using “I” statements, and improving listening skills–resources to teach these skills are included in the guide. The guide is divided into four broad sections: School-Wide Activities; Learning about Conflict; Communication Activities; and Conflict Management across the Curriculum.